Okay, tell me. Has anyone else ever had fried Chex or fried Cheerios? Anyone? Anyone other than someone in my family. My mom made them for my siblings and I when we were young. My mom's mom made them for my mom and her siblings when they were kids. And now I make them for my children. And I'd be lying if I didn't tell you that I also make them for myself. They're a yummy, crunchy treat. Salty too, if you like that. A tasty snack! If just takes Cheerios or Chex cereal (I used corn), butter, and a seasoning if you would like one. Melt some butter or butter substitute in a pan. I just dump some in, maybe a tablespoon or two. Start with a little and you can always add more. I'd figure maybe a tablespoon of butter per cup of cereal...or does that sound like too much? I never measure. After melting the butter add cereal and keep stirring so it doesn't burn to the bottom of the pan. The cereal will first get a little soggy from the butter, but as you keep stirring and frying it will crisp up. Sometimes a few Cheerios (if you use those) will get butter soaked and they will shrink and get brown. Those are the best. They're worth fighting for with your siblings. Once you've warmed the cereal up and crisped it up a bit, but haven't burnt it...take it off the heat. It only takes 5 minutes or less. Add some seasoning. We used sea salt. Seasoned salt is also good. Or a little cajun seasoning. Whatever tickles your palate. 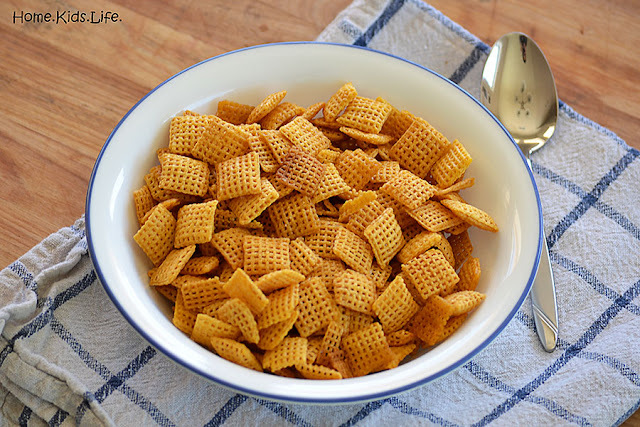 I made fried Chex as a snack for my kiddos today while indulging them in old Looney Tunes DVDs. Scooter is home sick again today. The poor boy doesn't have much of an appetite, but at least his fever has dropped. Chewy is just enjoying all the extra freebies she gets because someone else is sick. 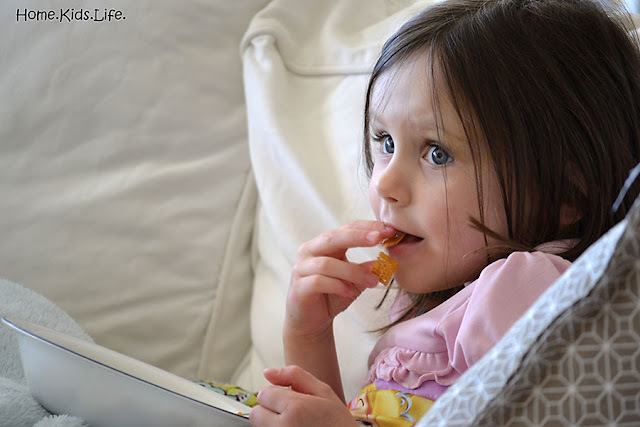 What snacks do you remember from your childhood? Are you a Chex or a Cheerios fan? And do I have to say that this isn't sponsored by Chex? Cause it isn't. I was just using their cereal. I also like Cheerios, though I wasn't paid to say that either.